Del Monaco, Silveri, Ticozzi, Tebaldi, Barbieri, Modesti, Barbesi, Maugeri, Mariano Caruso, Nessi; de Sabata. Orchestra e Coro del Teatro alla Scala di Milano, March 6, 1949. Downloadable .M4A or .MP3 files. Total size: approx. 85MB. Downloads are not eligible items in connection with our 6-for-5 offer. Please see this important information about our audio downloads. Chénier was the role with which Del Monaco changed singing by introducing a technique taught by Arturo Melocchi, based on singing with the larynx kept low, at the bottom of the neck. It gave Del Monaco a powerful, brassy, thick, muscular, penetrating sound. In March 1949 Del Monaco sang Chénier at La Scala. His performances excited the public and marked a changing of the guard. Gigli sang his final Scala performances in 1947, as Chénier. His object above all and that of the tenors he influenced was to caress you. Del Monaco’s was to excite you. 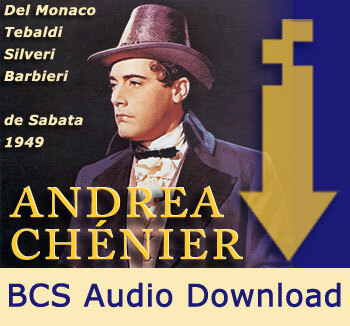 Del Monaco sang La Scala’s March 6, 1949 broadcast of Chénier. On hearing it Corelli, already having tried many teachers, went to study with Melocchi. Their lowered-larynx approach has been copied by Vladimir Atlantov, Giuseppe Giacomini, Luis Lima, Nicola Martinucci and a host of others. 12. Or io rinnego il santo grido!